Green Tea Chiffon Cake : Beating it Stiff! I believe every cook has its challenges. Every cook has its qualms. As for me there are only two things in this culinary world that always gave me the apprehension. It is the yeast and the beat-till-stiff-peak thing. Oh yes, shamefully, as a cook, I have yet to even bake a bread myself, the thought of culturing a colony of yeast and then kneading them together and then hoping they would multiply and make your dough grow fat, seem so daunting, impossible even. But then, yesterday I had just overcome the other one of my culinary shortcomings, though not without some glitches. Before this, I had failed before in my attempt unknowingly, when I baked the birthday cake for my Ah Ma, resulting in a dense short sponge cake. This time however, I had finally beaten those stubborn egg whites stiff and baked myself a chiffon cake! Hurrah! As a kid, I have always loved chiffon cake (similiar to sponge cake but lighter and taller). My Ah Ma used to bake a mean pandan chiffon cake. She can make them rise really high in her huge chiffon pan, which she had passed on to me and which sadly, could not fit into my mini oven. Besides, here in Malaysia, chiffon cake is really popular among the locals. The most popular one is of course, the pandan flavoured chiffon cake then next is the orange chiffon cake. My mum used to buy it a lot too for me to bring to school last time, and I absolutely love the soft texture and the soft feeling of it. One can eat the whole chiffon cake without feeling you had eaten a bomb. In case you’re wondering, I have yet to try to eat the whole cake myself, ha-ha. Nowadays in KL, we can find chiffon cakes easily in the Pasar Malam (night market) and also at any of the hypermarkets like Tesco and Carrefour, which gives even better prices. Every time I wanted to buy them I would stop myself and then think “hey, you can easily bake one at home!” In the end I would end up deprived of them, cursing myself all the time. After so long, I guess it finally paid off. I succumbed to temptation, flipped through thousands of chiffon recipes, choose a promising one, braced myself and finally baked one. Since this is such a well-loved light dessert for the Malaysians from eons ago, I am submitting this entry to Babe‘s Merdeka Open House 2006! 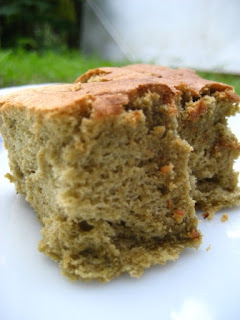 Though this cake can still be found easily outside, I believe it is no longer the common bakes of Malaysian households, in a way it is a long forgotten recipe. Now with this easy and adaptable recipe, I hope everyone will bake one their own, just like how my Ah Ma would and make some kid really happy. Do look out for this wonderful event as Malaysia celebrates its 49th birthday. All these while, I had always been used to the idea of pandan or orange chiffon cake, until I ate one cheese chiffon cake baked by C, a fellow KC during our first gathering. Then it dawned on me that chiffon cake is actually really versatile, and could be flavoured in anyway you would want to. In fact we had been having the chocolate sponge cake in our famous blackforest cake all these while unknowingly. Chocolate seems like a good choice, but no too normal, then I do not have any cheese in stock (not after I just baked off a batch of overdue ones), then suddenly I stumbled upon this recipe, from Jo’s Deli Bakery for green tea chiffon cake. now this is certainly interesting. I love green tea, as drinks and also especially in ice cream. It is certainly an exotic taste, which I found really versatile in a lot of things. This green tea flavour took the chiffon cake up to another level of sophistication altogether, setting it apart from the usual ones. The green colour can be deceiving, as my mind would keep tricking me that I am eating pandan chiffon cake, but when I chew on the soft cottony cake a few times, and revel a bit in the flavour, then the green tea will come through and oh wow, I’m lost for words. Let me go try another one (yes it’s an excuse) and come back with better words to describe it. This recipe is actually for a fancy birthday cake, all dressed up with whipped cream and green tea powder, but I just took the basic sponge cake and give it a try. After all this is about me and the egg whites war, so a basic chiffon cake will do. I do not have a chiffon cake pan, but I heard before that it can be baked in the usual round cake pan so there goes the pan problem. Well, I finally manage to beat my egg whites stiff peak, it stands on the tip of my beater and I can turn the bowl over my head without being splash white (Jamie’s way). Then I carefully fold in the green tea portion, taking care not to expel all the air I had whipped in. Now everything seems find till this step, but my one mistake is, I believe, my oven was too hot when I put it in. Before that I had been baking a chocolate cake at higher temperature, though I had lowered it down for a while before putting in the chiffon, apparently it is still hot, half of the top blacken considerably slightly after half time and that part did not rise as much, this is because my temperamental oven are usually hotter at the inner left, I don’t know why. Another thing to note is I used a 9 inch pan, instead of the 8 inch that the recipe called for, that is why my cake was shorter and with that it baked in a much lesser time, which luckily I check with a toothpick and took it out sooner. Oh ya, I also took care not to peak until only the last quarter of baking time. A few things that I noted from this recipe are, first I would dissolve the green tea powder in the water, then only add to the flour mixture. As for the egg yolks, it should be beaten first, then add with the oil and beat further to mix well, as both are of the same kind, it should be easy and then add to the flour mixture too. This way it will be easier to incorporate everything together, which I had a hard time earlier. I would be reflecting these in the recipe. Next time, I would also go back with the 8 inch pan and bake at the right temperature (until I found how to deal with my oven), and if possible get myself a chiffon cake pan for better heat distribution, in case you don’t know, chiffon cake pans have a tube in the middle for the heat distribution along with the sides of the pan. Now that I had finally successfully baked chiffon cake, and love it, I would be baking more soon, so definitely worth the investment (note to self). Look out for more of my chiffon cakes adventure, I would still be going back to this green tea a lot, but of course I will be experimenting on other flavours too, yum! Sift flour, baking powder and baking soda into a bowl. Beat the egg yolks, then add in oil and beat well again. Dissolve the green tea in the water. Stir in both the oil and water mixture into the flour mixture. In a separate clean bowl, whip the egg whites and cream of tartar till bubbly. Update: We devoured (virtually) all the food at Babe’s Merdeka Open House 2006! Flourless Chocolate Cake : Smile!